Turtle Island is bisected by the Michigan/Ohio state line and the lighthouse sits on the Ohio side of the island. 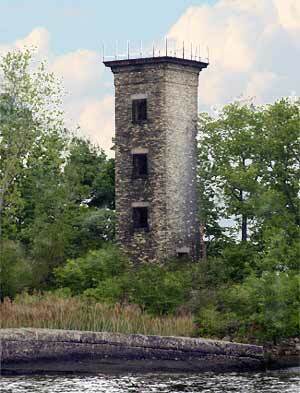 It was abandoned in 1904 when the Toledo Harbor Light began operation. It is currently privately owned. Turtle Island itself is a very small island located 4.5 miles from shore in the middle of Maumee Bay. The lighthouse was constructed in 1866, replacing the original beacon from 1832. The lighthouse became redundant when nearby Toledo Harbor Lighthouse was built in 1904. Once the Toledo Harbor Lighthouse came online, the Turtle Island light was, and over the years deteriorated from lack of upkeep. Turtle Island is privately owned now, and the owner is reportedly building & repairing the few residential structures located there. Turtle Island is named for the famous Miami Native American, Little Turtle who played a key role during the American Revolutionary War.